For every person who told Sobia Ahmad they were too afraid to submit their ID photo, she added a blank tile to her project. Sobia Ahmad is building a wall. Not a border wall, like the one being debated in Washington; hers is an installation art project that wants to highlight the faces, fears, and faith of America’s Muslim immigrants. 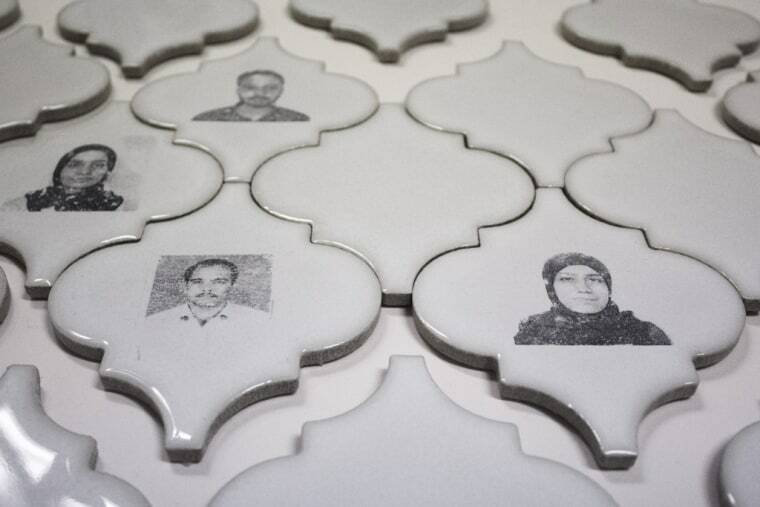 The Washington, D.C.-area artist’s new piece, “Small Identities,” features a swathe of white arabesque tiles stamped with tiny, black-and-white faces copied from passports, drivers’ licenses, and green cards that she’s been compiling over the past year. This is a reflection of the times we're in, and I had to report that. The idea hit Ahmad, who is now 25, back in November 2016, around the time of President Donald Trump’s election and rhetoric continued to build about a wall between the U.S. and Mexico. But she didn’t begin the work of collecting Muslim immigrants’ ID photos for her project until after Trump’s inauguration last January, and when the administration announced its intent to restrict travel from six predominantly Muslim countries. At that point, Ahmad had been working on a series of videos depicting her praying in the streets of D.C. and Baltimore. It was a response to the verbal abuse and “new wave of Islamophobia” she experienced herself, but after the news of the travel ban, she decided to wanted to explore narratives beyond her own. Ahmad’s wall installation will be the centerpiece of her solo show at the VisArts gallery in Rockville, Maryland, from Feb. 16 to March 18. But viewers there may notice something strange about the project: the majority of it is empty. So for every person who told her they were too afraid to submit their ID photo, Ahmad added a blank, white tile to her project. So far, she has collected about 25 ID photos — and more than 80 empty tiles, each one representing “the fear, the psychological toll” of the travel ban and the political climate at large, she explains. Her project had, over the year, accidentally becoming a documentation of the widespread fear within the American Muslim community. And while she was happy to let the project take shape as it did, Ahmad said the responses made her begin to wonder whether her art was endangering its subjects. For her, the stories of broken families and stalled immigration proceedings are personal. When Ahmad left the Pakistani city of Gujranwala for the U.S., she, her mother, and younger brother left behind her father and older brother. Both had to wait years before they received their visas due to higher security measures for men. That led to her first brush with activism: in ninth grade, she wrote a letter to then-Congressman Chris Van Hollen criticizing the injustices of the U.S. immigration system. Ahmad initially tossed around other ideas: asking immigrants for their initials or signatures, taking photos from their backs. But the image of the 2-by-2 passport photo strong as a political symbol, she said. And as stories about people being detained at airports and held in detention centers made headlines every day, she felt even stronger about using it. The result? An intimate look at society’s belittling, politicalization, and erasure of Muslim identities and narratives, she said.